A dear friend made a blog request the other week for fish. Innocent enough, right? Yet I instantly felt paralyzed. For not one, but two reasons. The first is easy: fish is definitely not my strong suit in the kitchen. I’ve been known to buy gorgeous fillets of salmon and halibut only to overcook/undercook/generally destroy said fish in myriad and creative ways. I did not have that magic touch, which turned out to be fine because the kids rarely clamored for a fish dinner. Until recently. But more on that in a minute. The second reason for my hesitation is more challenging to explain. As a passionate environmentalist and public health advocate, I am acutely aware of the slow but steady destruction of our oceans, evidenced by the continuing decline of fish stocks among other factors. Couple this with the fact that many fish we eat, while so healthy and delicious, also happen to be seriously contaminated with industrial pollutants like mercury, led me to stop eating fish altogether in recent years. Lucky for us, several incredible environmental organizations have created handy guides that provide recommendations on how to make fish choices that are best for the oceans AND best for our health. With the explanations out of the way, we’ll come back to kids clamoring for fish. Recently, Ava asked about a dinner I made years ago, one that she summarily rejected if memory serves me. 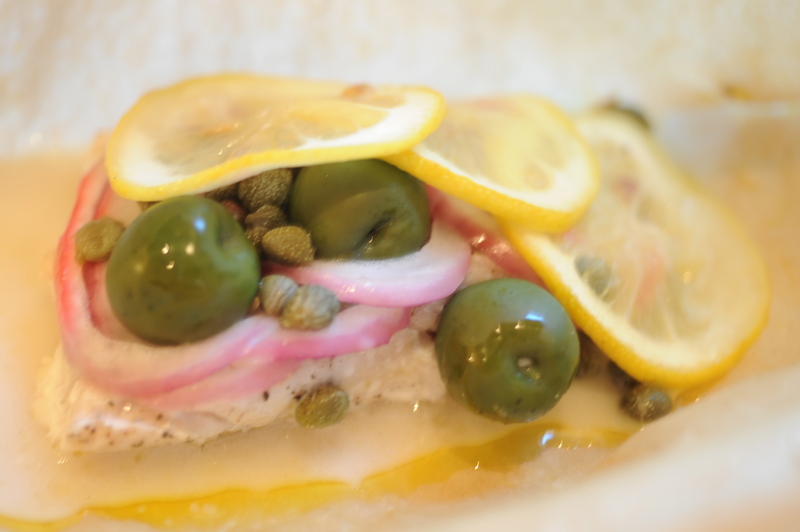 It was halibut “en papillote,” and her excitement caused me to set my hesitation aside and give fish another try. We discovered in the process that everything IS better gift wrapped. These lovely little packages of perfectly steamed fish are now a favorite family meal. You can use any white, flaky fish you like (ideally, from a sustainable source). Add any combo of aromatics and vegetables you prefer and/or have on hand. 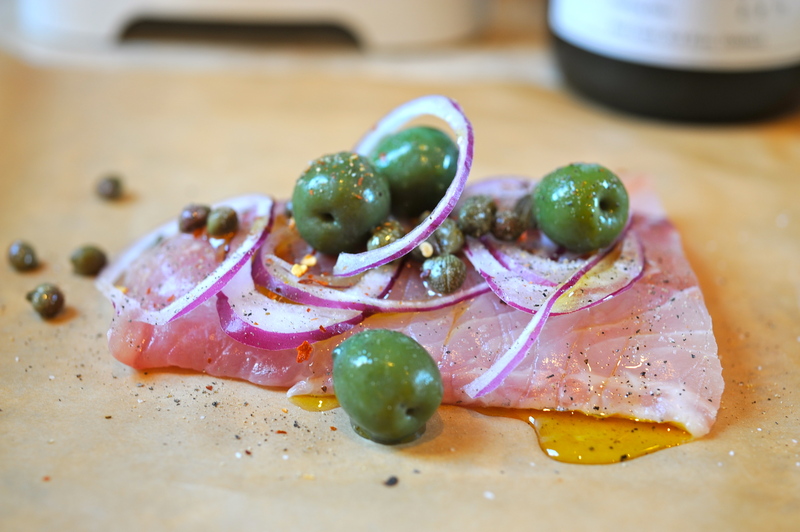 Right now, we are into a caper-olive version with sliced onion and lemon. I can’t wait to try an Asian-inspired combo with sliced ginger/lemongrass/scallions/soy sauce/sesame oil. Preheat oven to 425°. Gently cut 1-1.5 pounds of fish fillets into four equal pieces. 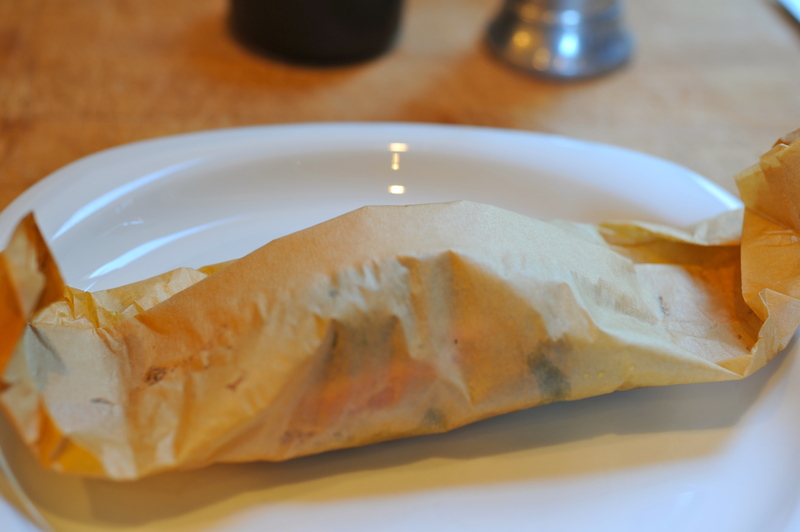 Tear off 4 sheets of parchment paper – about 12-14 inches long depending on size of fish. Arrange your toppings, which could include salt and pepper; oil (olive oil, sesame oil, walnut oil, whatever works for the flavor profile you are choosing); soy sauce; chili flakes; chopped herbs; lemon slices; onion/scallion/shallot slices; olives; capers; roasted red peppers; the list goes on and on! 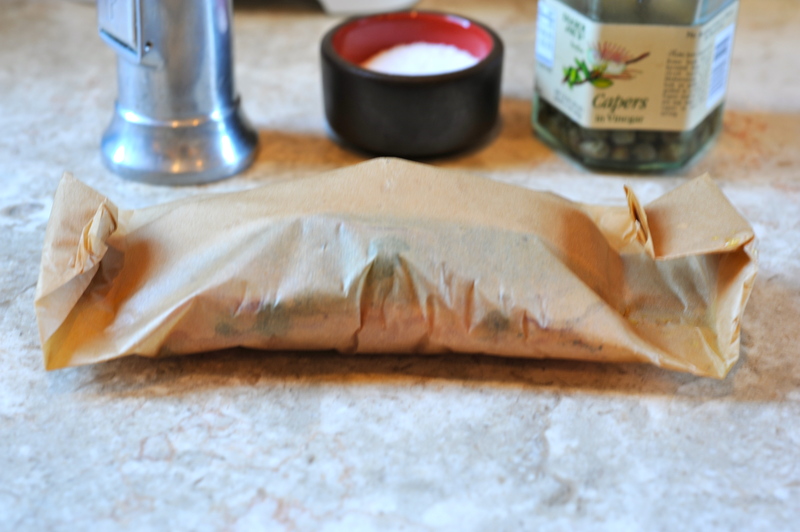 Place fish in the center of parchment paper, in line with the shorter direction of the paper. Generously sprinkle fish with salt (or soy sauce) and pepper, and drizzle with oil of your choice. Add toppings to the fish – this is a great time to include your kids into the cooking experience. After all, when’s the last time they got to decorate dinner? Bring parchment paper ends edge to edge, with the fish and toppings in the middle. Work your way down in small folds until the fish is snug underneath the paper. The outer edges will still be open at this point so fold each down into a triangle like you would wrapping paper, then work your way in toward the center. Those edges probably won’t stay folded perfectly but it will work. (As an aside, there are other, probably prettier ways to create the folded packet – I urge you to share them if you try any out!). Transfer packets onto a baking sheet and place in the 425° oven for 15-20 minutes, depending on thickness. Serve alongside a whole grain, roasted potatoes and vegetables, a salad, anything works. Do be careful opening the packets – they are filled with steam so this part is NOT for little hands. The final photo, ready to eat! I made a version of this which was a success in our home too! I marinated some sole fillets (catfish would be good too) in soy, lime juice, ginger, celery, and garlic for a few hours first. And before baking them “en papillote” I added olive oil, salt, basil, and shallots and served with brown jasmine rice and veggies. It turned out very flavorful, and our 3-year-old liked it too. Thank you for the inspiration, Lena. OMG – this was so quick, easy and fabulous! My husband spent the better part of dinner trying to determine how much you could charge for this dinner in a restaurant… My kids dug it — the package was fun, the fish perfectly tender and sufficiently flavorful with nothing suspicious on it to throw them off. I made one addition I would highly recommend: motivated by laziness (which is really the mother of all invention, no? ), I thinly sliced some red potatoes and put a few under each piece of fish. They cooked up perfectly, absorbed some of the juices and provided a little starch to fill out the meal with almost no extra work. I heated up some T. Joe’s lentils on the side and voila, a seriously tasty dinner in about 20 minutes! Oh, and then there’s the cleanup — the hobgoblin of weeknight cooking If you’re careful about sealing your packets with tight folds, there is nothing to clean up at all besides dinner plates. This one will be in heavy rotation! I LOVE the thinly sliced potato addition to the original concept! Tried it the other day and it was a big hit. And yes, the ease of cleanup with this is a huge bonus – especially on a weeknights. So my husband was joking the other say that I am kind of obsessed with “papillote” method of cooking but it works so well!! A good place to buy sustainable fish is “Fish” in Sausalito…. On the topic of fish…I never thought I’d see the day that I actually enjoy Russian food, but after years of being utterly grossed out by it, I have a new appreciation for herring. It’s actually very low in mercury and super high in DHA and Omega 3s and it’s not overfished as far as I know. My dad makes a great ‘selyodka pod shuboy’ with more veggies and less mayo.